As some of you may know, every year I offer Poetry Workshops at Whitby Folk Week, which is one of the nicest, friendliest folk festivals out there. This year was my seventh year of workshops and my 12th year of attending the festival. This year was its 50th year, which is an amazing achievement. I wanted to showcase a few poems from the workshops this year, so invited participants to send me some for my blog. This one was sent by Vikki Appleton Fieldon, an American who now lives in Yorkshire. Vikki acted as our steward a few years ago and has been hooked on the poetry ever since. She is also a talented songwriter, and an excellent singer. Inviting entry to a special space. you’re the one whose sick. I don’t want to keep. in the early morning sunlight. eager to learn a new tune. who could only just walk. Thanks to Sharon and Vikki for sending me these poems. If you went to the sessions and wrote poems at any time during the last 7 years, you can send me your poems and I will feature as many as I can. Or you can paste them into the comments on this blog. The time for Whitby Folk Week is approaching. This annual, warm and friendly folk festival runs from noon on 22nd August to Friday 28th August. I will be running daily stand-alone poetry workshops in the early afternoon each day starting from Sunday 23rd. Each session lasts for an hour and twenty minutes. While there are regulars who attend every year, there is also a steady stream of new people who are made very welcome. 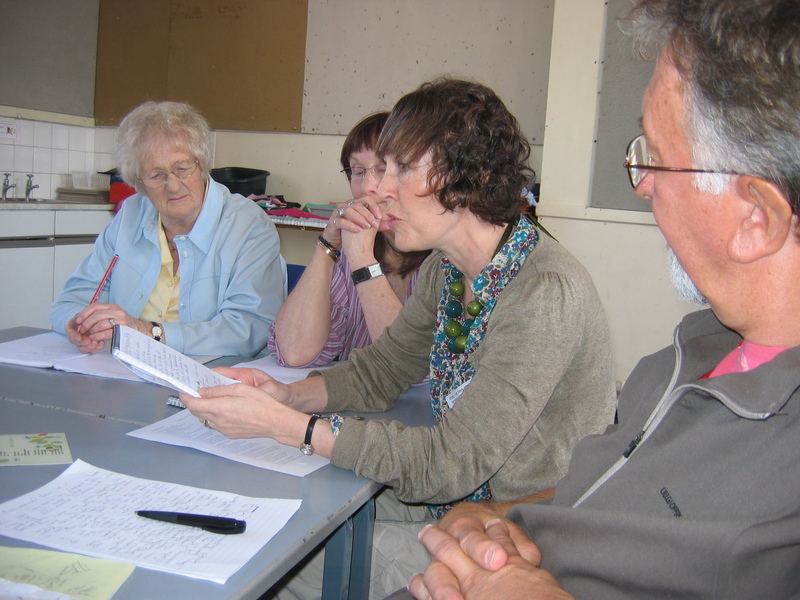 I started leading these workshops about five or six years ago, taking over from the kind and friendly Yorkshire poet, Jay McShane. Whitby is a rather special festival; it’s an annual date for many, and familiar faces seem to pop up everywhere. There’s something for everyone, from small intimate venues to larger ones like the Spa, The Metropole Hotel Ballroom, and the Spa theatre. There are traditional singers, transatlantic performers, every kind of instrument that you can think of, dances, dancers including Morris, and the mornings are given over to loads of wonderful workshops for beginners right through to advanced. There’s also a craft and music fair, which is a great place to informally meet up between events. I love being part of this festival and my proudest moment every year is joining the other artists to sing the chorus to The Wild Mountain Thyme at the front of the stage, before the heather wreath is divided up and shared out as a pledge to return next year. I’ve made many friends at the festival and have many special moments. This year is its 50th, and I have only been going for about 13 years. There have been many changes over this time, particularly of venues, which become available and unavailable as time goes on, even in the short time (relatively) that I have been going. Whitby is one of the most reasonable festivals to attend, and unlike many, it is not in a field with tents, but indoors with seats, so it’s much easier for me. 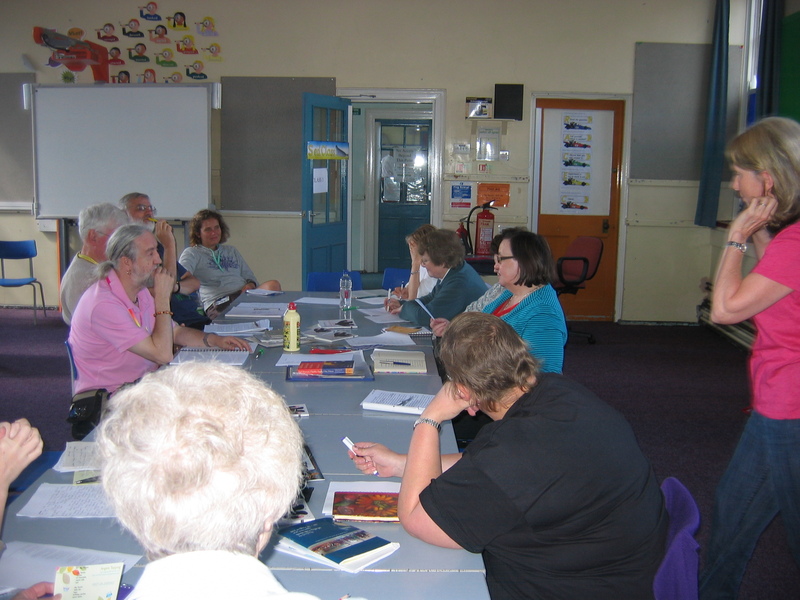 I will soon be getting down to planning my poetry workshops. We usually start with a hot penning to a simple prompt, as a warm up, then move into different exercises, always with chance to feedback and gain some pointers from everyone else, or just for the fun of it. We will often read some poems by published writers too, for stimulus and to help us get into the right zone, to ‘tune in’ as it were. Some of the attenders are musicians and dancers, others have come to the festival with family and are glad to find there are some different activities to do. On the last day, the Friday, we have a readaround, in which the available time is divided by the number of people who want to read and everyone gets their slot to come out to the front and entertain us with their work. I give advice on publication opportunities and encourage people to support poetry events local to them when they return home. 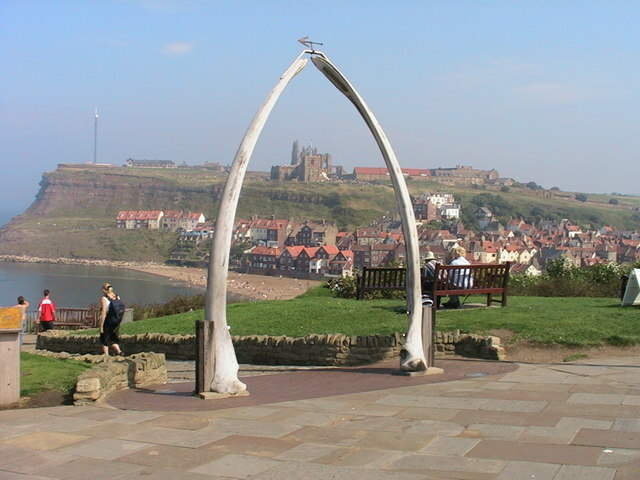 There is something very inspirational about Whitby itself: the literary connections, the spectacular coastline, the dramatic abbey, and the views of the moors. There are also some amazing eateries. It is a place I love to return to every year. This lovely poem by Gordon Jackson was written from my instruction poem stimulus, after looking as Jaques Prevert’s poem ‘How to Paint a Picture of a Bird’, and my own ‘How To Build a Sandcastle’, and ‘How to Capture a Poem’. is the type of woodto use. 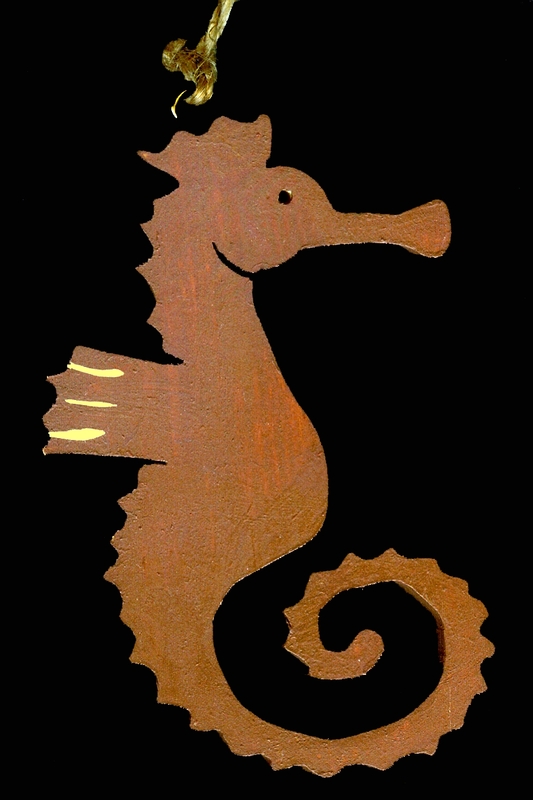 and cuts like a dream on the scroll saw. leave for five minutes to bond. very little debris to sand off later. and the blade won’t bite. and wipe the dust off with sticky web. fins marked in pale yellow. Well done, pour yourself a drink. 4th Sept. 2010. 2:25 p.m.
For Anji Topping’s web Site, by request. This was my first year of being a ‘performer’ at Whitby, stepping in to the big boots of the lovely Jay McShane, to do the poetry workshops. It was wonderful to get such a great turnout, particularly since the events did not happen last year.There were lots of new people, as well as the loyal regulars. It was particularly good to see Cynthia, Roger and retired pirate Gordon Jackson again. The first day I took a theme of memories, with the hot penning exercise taken from Michael Frayn’s novel ‘Spies’, ‘even here, even now’. This was interpreted in a variety of ways – the test of a good prompt. An exercise to describe an old toy also proved very stimulating and produced some superb work. We read poems by Elma Mitchell and Li Young Lee, and had a fascinating discussion about line breaks. Day two was all about the seaside, and Whitby in particular. Typicall, this was the day it chose to rain! We had great fun mentally owning our own beach huts. It was lovely for me that my friend Gordon Tyrrall came to lend his support and do some writing. Writing an instructional poem based on my own ‘How to Capture a Poem’ and ‘How to Build a Sandcastle’ and Jacques Prevert ‘How to Paint a Picture of a Bird’ resulted in some lovely work. 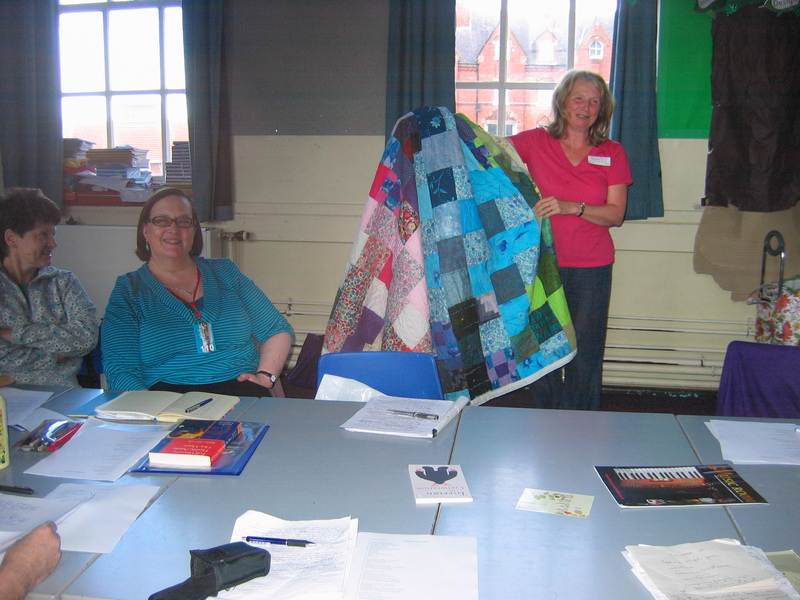 Ann wrote about how to make a patchwork quilt, using it as a metaphor. She illustrated this in the readaround by bringing her quilt; not a scrap of material in it had been purchased, so it literally was made of memories, in the shape of bits of her daughter’s skirt, and other fabrics from the fabric of her life. Day three was about Special Places and Special things. We designed a garden for a famous person, using an idea of Dave Calder’s, a wonderful Scottish poet who is based in Liverpool and works, like me, with The Windows Project, a charity which puts writers into community venues. We also looked at Pablo Neruda’s wonderful odes and as usual, these beautiful lyrics produced some inspired work from my happy group of blooming writers. They have all promised to send me poems I can upload and share. After the three sessions, I handed over to Roger and Gordon, affable hosts of the readarounds which take up the final three days of the festival. We sit on a circle for this, and welcome an audience as well as anyone who wants to read or recite a favourite poem or indeed one they have written in the last few days. We chat a lot as well, but everyone gets two goes at reading. It’s really a ‘Do it from There’ for poetry. 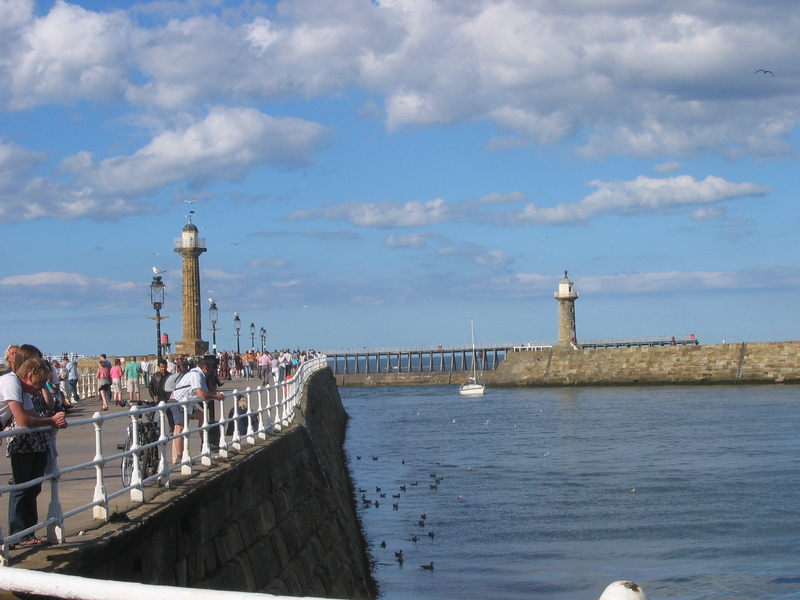 The spoken word thread is of vital importance at Whitby and it seems to be thiving. There was much hugging as we all parted, to meet again next year. I hope our new recruits stay with us. Thanks to all for the wonderful participation. And thanks to Jay McShane for starting the wokshops, our lovely steward and Esther Ferry-Kennington (the workshop organiser) for getting us a great venue and for being so approachable. Here’s to next year!